In 1966, Star Trek set out to boldly go where no series had gone before, beginning a three-year mission that led to a franchise that would last decades. Here at last is the first season of the original series all in one box, 29 episodes in their original broadcast order. That means starting with "The Man Trap," and soon followed by "Where No Man Has Gone Before," the second pilot filmed and the first one starring William Shatner as Captain Kirk. The many highlight episodes include "Balance of Terror" and "Errand of Mercy" (introducing, respectively, the Romulans and the Klingons), the two-part "The Menagerie" (which recycled footage from the original pilot, "The Cage," which featured Christopher Pike as the captain of the Enterprise and is not included in this set), "Space Seed" (introducing Ricardo Montalban's Khan character), and "The City of the Edge of Forever" (written by sci-fi giant Harlan Ellison and considered by many the best-ever episode of the series). 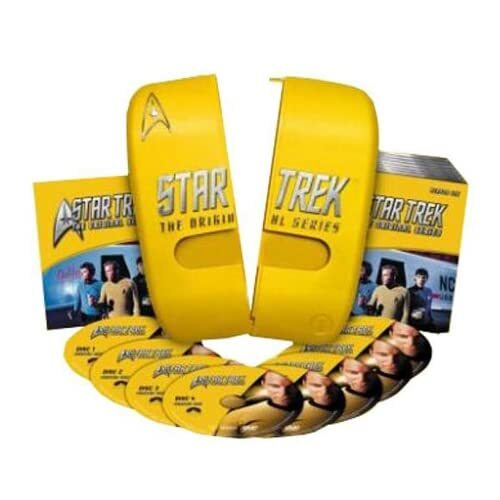 The first-season DVD set is supplemented by 80 minutes of featurettes incorporating 2003-04 interviews with Shatner, Leonard Nimoy, other cast members, and producers, and some 1988 footage of Gene Roddenberry. The longest (24 minutes) featurette, "The Birth of a Timeless Legacy," examines the two pilot episodes and the development of the crew. Slightly shorter are "To Boldly Go... Season One," which highlights key episodes, and "Sci-Fi Visionaries," which discusses the series' great science fiction writers (most famously in "The City of the Edge of Forever"). Shatner shows off his love of horses in "Life Beyond Trek," and, more interestingly, Nimoy debunks various rumors in "Reflections of Spock." As they've done for many of the feature-film special editions, Michael Okuda and Denise Okuda provide a pop-up text commentary on four of the episodes filled with history, trivia, and dry wit. It's the first commentary of any kind for a Star Trek TV show, but an audio commentary is still overdue. The technical specs are mostly the same as other Trek TV series--Dolby 5.1, English subtitles--but with the welcome addition of the episode trailers. The plastic case is an attempt to replicate some of the fun packaging of the series' European DVD releases, but it's a bit clunky, and the paper sleeve around the disc case seems awkward and crude. Still, the set is a vast improvement both in terms of shelf space and bonus features compared to the old two-episode discs, which were released before full-season boxed sets became the model for television DVDs. Last edited by cb5454 on Sat Feb 24, 2007 2:08 pm, edited 1 time in total. Whoa..something I've waited for a very long time! thanks. whens the 3rd disc coming out? Oops been away for a while. Updated all the way to Disc 8 and done!